San Andreas is similarly structured to the previous two games in the series. The core gameplay consists of elements of a third-person shooter and a driving game, affording the player a large, open environment in which to move around. On foot, the player's character is capable of walking, running, swimming (the first GTA game in which diving is possible), limited climbing and jumping, as well as using weapons and various forms of hand to hand combat. Players can operate a variety of vehicles, including automobiles, boats, airplanes, helicopters, trains, tanks, motorcycles and bicycles. Players may also import vehicles rather than steal them. CJ is Grand Theft Auto's most customizable [[Protagonist|protagonist]] due to the possibility in-game to change his clothes, tattoos, hairstyle and even his body mass in which he can be fat, skinny or muscular. Grand Theft Auto: San Andreas also reintroduces over-the-top-gamplay seen in the games [[Grand Theft Auto: Vice City]], [[Grand Theft Auto: The Ballad of Gay Tony]], and [[Grand Theft Auto: Chinatown Wars]]. San Andreas is similarly structured to the previous two games in the series. The core gameplay consists of elements of a third-person shooter and a driving game, affording the player a large, open environment in which to move around. On foot, the player's character is capable of walking, running, swimming (the first GTA game in which diving is possible), limited climbing and jumping, as well as using weapons and various forms of hand to hand combat. Players can operate a variety of vehicles, including automobiles, boats, airplanes, helicopters, trains, tanks, motorcycles and bicycles. Players may also import vehicles rather than steal them. CJ is Grand Theft Auto's most customizable [[Protagonist|protagonist]] due to the possibility in-game to change his clothes, tattoos, hairstyle and even his body mass in which he can be fat, skinny or muscular. 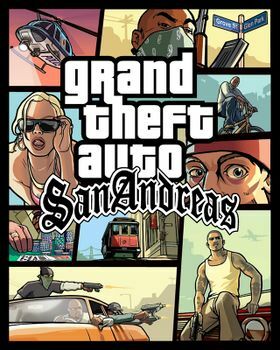 Grand Theft Auto: San Andreas also reintroduces over-the-top-gamplay seen in the games [[Grand Theft Auto: Vice City]], [[The Ballad of Gay Tony]], and [[Grand Theft Auto: Chinatown Wars]].